Two-time Champion Hurdle victor Buveur D’Air trounced his rivals to win the Fighting Fifth Hurdle at Newcastle for trainer Nicky Henderson. 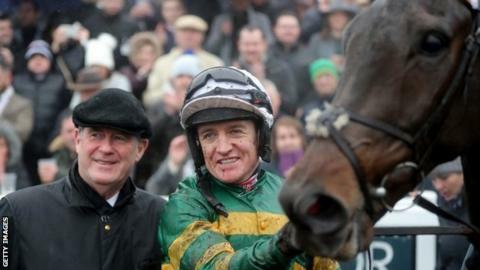 The 11-8 chance, under Barry Geraghty, powered clear of the 6-5 favourite Samcro to triumph by eight lengths. “That was an incredible performance. There is so much more improvement in him,” said Henderson. Sizing Tennessee, with Tom Scudamore on board, won Newbury’s Ladbrokes Trophy in a 1-2 for trainer Colin Tizzard. It was an emotional victory on the 12-1 shot for Scudamore, who missed his grandfather’s funeral on Friday due to racing commitments. “This one’s for him,” said Scudamore, as he looked to the skies after Sizing Tennessee finished ahead of Elegant Escape. Meanwhile, Buveur D’Air is likely to run next in the Christmas Hurdle at Kempton before seeking a Champion Hurdle treble. It was a fifth Fighting Fifth win for Henderson, who mapped out a similar path last season for his victor. “I thought it was very smooth and slick. He looked like a true champion,” said the trainer.